Sometimes you want fast food, but delicious quick lunch options because you don’t have time to pack your own. Los Angeles does an excellent job satisfying hunger pains and keeping taste buds aroused with casual and convenient lunch spots, some coming more with a side of guilt than others. Try one of these restaurants for your next lunch outing. The only place to dock your boat and dine in L.A. is in Marina del Rey at Killer Shrimp. Sit outside with peaceful sailboat views and savor their zesty peel ‘n’ eat shrimp, seafood options galore, happy hour prices and specialty drinks. 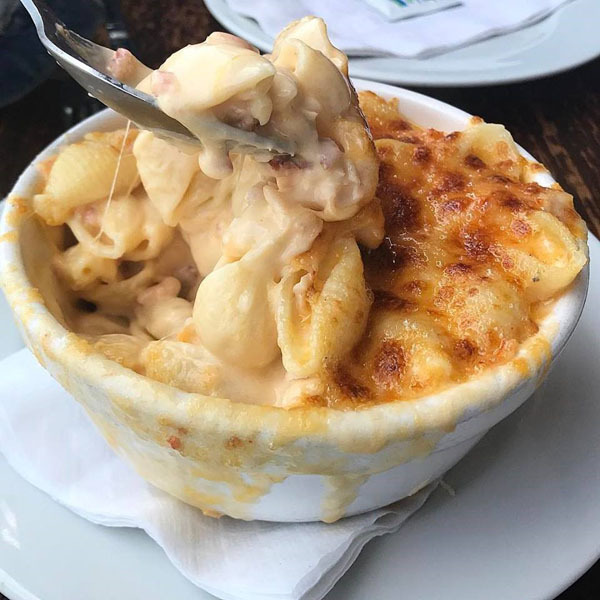 This casual spot is worth just coming for the Lobster Mac n’ Cheese with giant chunks of lobster for $14, Lobster and Shrimp Enchiladas, and Killer Crab Claws drizzled with butter, lemon, and rosemary combined with their secret Killer Shrimp spices. The Killer Shrimp ‘Original’ is a 30-year-old secret family recipe where the spicy sauce is simmered for ten hours, then the shrimp is added and cooked quickly, served piping hot with French bread for dunking. The full menu is served for lunch and opens at 11:30. Find their other location right on the beach steps from the sand in Hermosa Beach. Chef Owner Diego Leporini takes American comfort food to the next level with artisan breads, fine European cheeses, and cured meats infused with a twist of Americana. 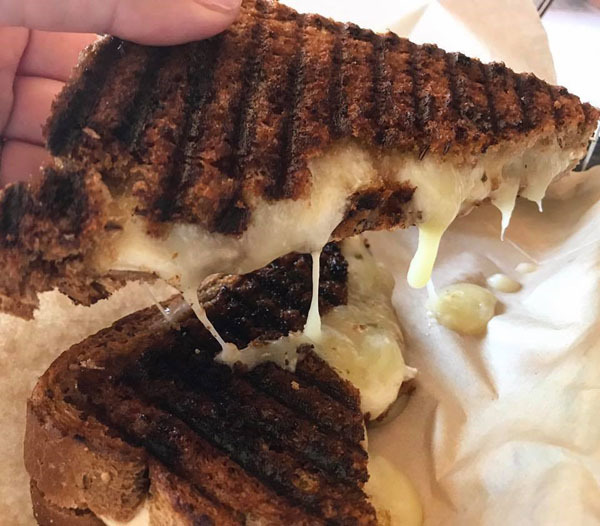 In West Hollywood, find him crafting unique grilled cheese medleys like the Brie Y’once with manchego, brie, and truffle butter on rye, Donald Duck with grilled goat cheese and duck confit, or the Holy Crab! with jumbo crab, taleggio, and herb butter on sourdough bread. There are so many cheese combos, from pears and sun dried tomatoes to sweet tooth options like The Sugar Daddy jamming Nutella, strawberries, cinnamon, and sugar on raisin bread. Enjoy your own cheesy bliss or split several oozing combinations with friends. Dunk sandwiches in heirloom tomato bisque or butternut squash soup. Pretend you are back in Spain or France with Baked Camembert with honey, thyme, pear, and croutons. The casual welcoming spot next to The Guild is also perfect to watch sporting events on their large screen TV since their craft beer program offers 20+ rotating craft bottled beers to appease beer aficionados. How about pairing a special grilled cheese with wine or a craft beer for your lunch break? Every corner you turn in Los Angeles there is a new poke shop opening up. B.H. Poké offers a healthy quick lunch with huge portions, fresh fish, and many options to spice up your poke. A long check-off list helps you craft the ultimate poke bowl. For the base, you can choose brown or white rice, organic mixed greens, seaweed salad, or even handcut fries or hard shell corn tacos! After the base, pick your fish (salmon, tuna or tofu are my favorites), choose your sauces, and add toppings like pineapple, jalapeño, Maui onion, cucumber, avocado, fish roe, and/or mango. To finish your poke masterpiece, top it off with these offerings – pickled ginger, 7 spice, black sesame seeds, toasted coconut, crispy onions, furikake, and more. Hmmm healthy eating! I added numerous add-ons to the regular size (about $10.95) and I could only eat a quarter. My scrumptious concoction consisted of brown rice, ahi tuna, tofu, wasabi mayo, cucumber, green onion, edamame, avocado, mango tobiko seaweed salad, black sesame seeds, and crispy onions. Fish and chips are also on the menu, and for $5 they give you a generous portion of sweet potato fries with aioli dipping sauce. B.H. Poké, the first poké in Beverly Hills, will be coming to Eagle Rock soon. In downtown LA right below the PacMutual Building, step into this French bakery cafe to grab a healthy salad, crepe, quiche, pastry, sandwich, or sides (like Carrots like in Paris). Pitchoun!, the vision of of French husband and wife duo, Frédéric and Fabienne Soulies offers authentic French dishes prepared from scratch, freshly baked artisan breads and fine housemade pastries. 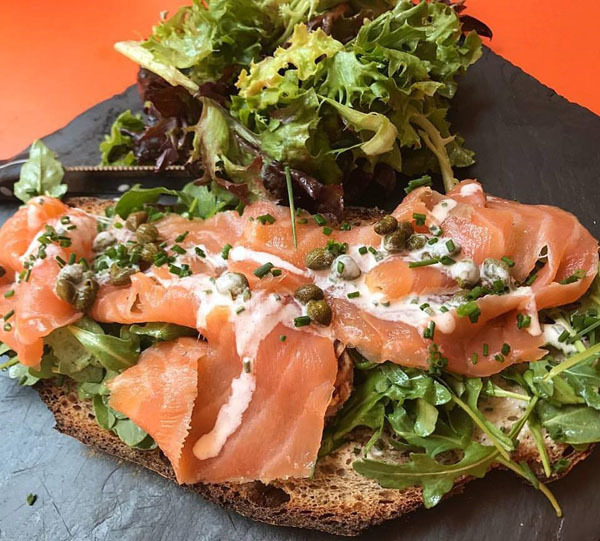 My lunch began with the North Pole, a fresh smoked salmon tartine with capers, arugula, and chive and shallot spread although I admired all of the tartine selections like the Sunshine Tartine with proscuitto, zucchini, ricotta, pine nut, rosemary, olive oil and garlic. The healthy Nicoise Salad with anchovies and hearty pieces of seared tuna was enough for two. A beautifully crafted fig tart was the sugar ending I needed. The pastries are drool-worthy from French eclairs, petit cakes, croissants, tarts, creme-brule, gougères, and more. A myriad of coffees and tea varieties will compliment your lunch. Why do the French always get it so right? Nearby Pitchoun! 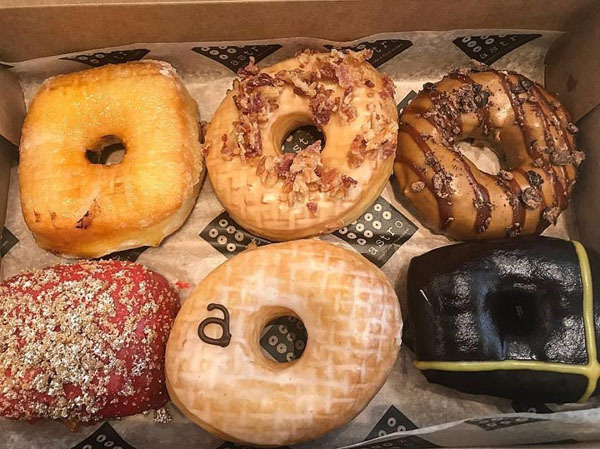 and Pershing Square is a more glutinous galorie-laden option, Astro Doughnuts and Fried Chicken, the first west coast location co-founded by a former Los Angeles King, Jeff Halpern. Their creme brule doughnut was touted by the Washington Post and Thrillest named Astro one of the “Best Donut Shops in America.” The Vanilla Glazed doughnut is like a traditional rich glazed doughnut, while other elaborate flavors include Maple Bacon, Peach Melba, Passion Fruit Boston Cream Pie, French Toast, Blackberry Lime Tart, and Chocolate Caramel Macchiato. Before 11 AM, try a succulent fried chicken sandwich with bacon and egg on a Cheddar Biscuit at their counter space. You can opt for a Potato Roll or a Savory Doughnut as a roll. Feeling more for just juicy chicken with a nice crunch? Chicken Fingers and chicken pieces from two to eight can also be ordered. The Deck on the third floor of Hollywood and Highland offers many quick and easy lunch choices all in the same location. Spice up your lunch by ordering from several of the quick take-out restaurants. 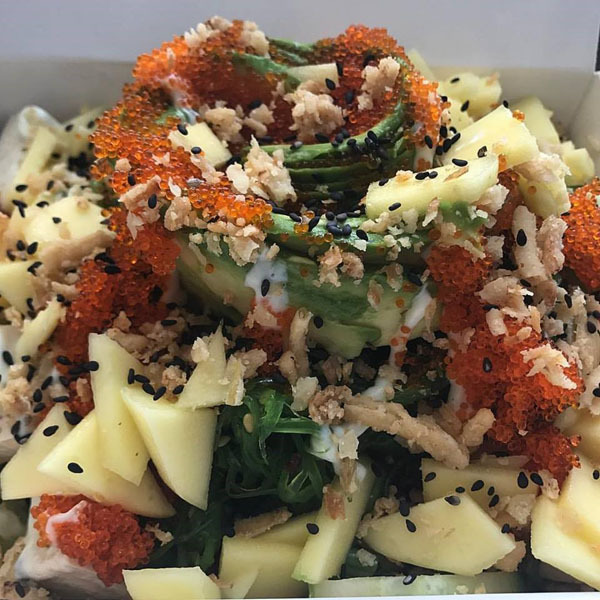 Jinya Ramen Express offers ramen bowls and Japanese sides, and PokiNometry brings you poke with salad, sushi rice, harusame, wonton or tortilla chips. You can even get your poke in a wrap. Crabmeat is a rare poke option on their menu, and you can choose your spiciness level. Fist of Fusion offers marinated meats and tofu in Hawaiian-style rice bowls, burritos and salads. We tried a Spam burrito! Mamacita brings you casual Peruvian/California-inspired bowls and wraps from famed Chef Ricardo Zarate. 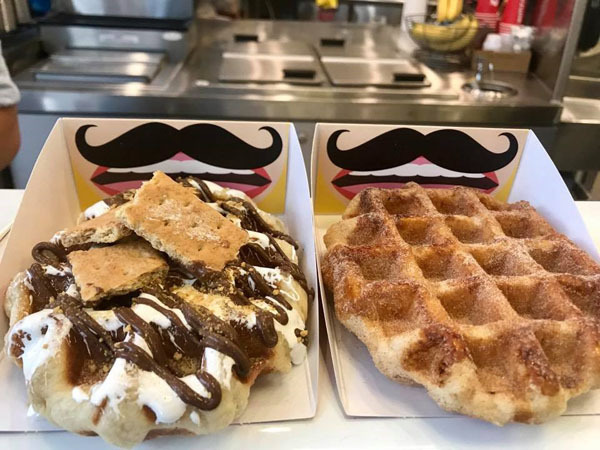 Find room for dessert at WaffleJack with their crunchy dessert waffles either plain or with a vast selection of toppings like S’mores, and don’t miss Cold Stone Creamery’s Birthday cake remix with cake batter ice cream infused with brownie and fudge topped with colorful sprinkles. Beyond lunch, did you know that if you are a Hollywood Bowl visitor, you can avoid the $40 parking lot fees, and park in the Hollywood and Highland lot. You can go up to the Deck and get an array of to-go bites from Deck vendors while avoiding the Bowl parking and food vendor lines in one swoop. For those that park in the center, there is a $6 shuttle that takes people up or its just a five minute walk up the hill. Imagine being able to slip away after a show without dealing with the exit routine of the Bowl’s stacked parking. Also, Hollywood and Highland’s annual Summer Jazz Series is about to kick off too with top tier performers. The Series will be free to the public, but there are VIP tickets for sale which benefit Project Angel Food. $14 buys preferred seating and wine, beer and cheese during the show.